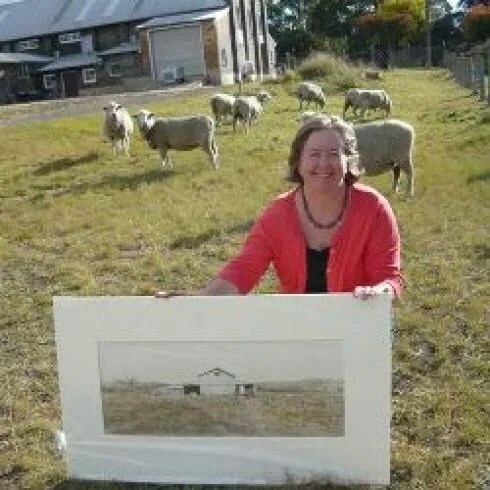 “I might be painting sheds but in the background are always the sheep” photo by Gail Galloway. 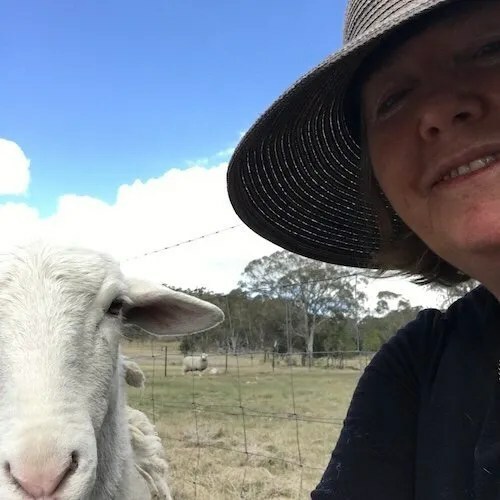 Australian artist Christine Porter in her journey as a “serial artist-in-residence” throughout rural and regional Australia since 1984, has built an art practice about the sheep and wool industries. 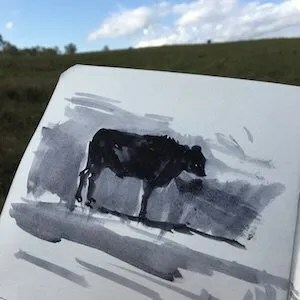 She also makes artwork about cattle, and occasionally horses. 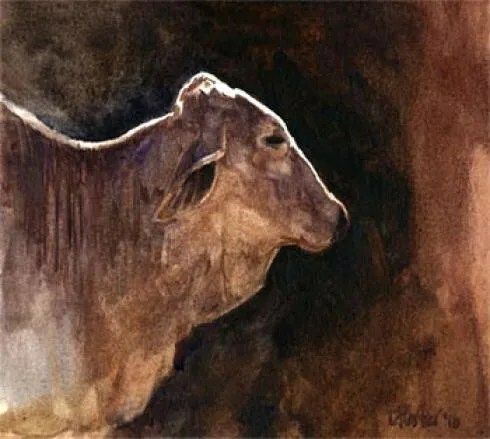 ‘The Hereford’ 1995 watercolour on paper 59x45cm collection of Barcaldine Shire Council. 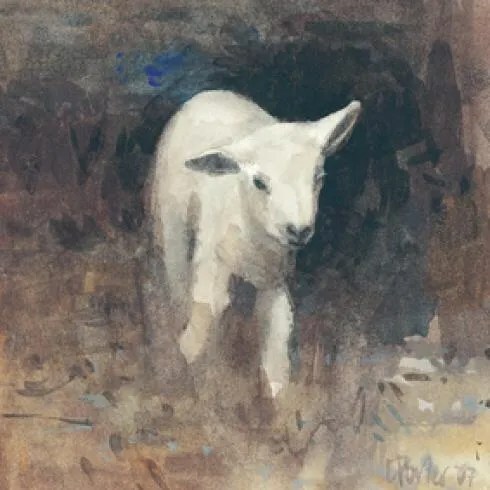 In 1990, Christine had been painting woolsheds for some time, along with the occasional attendant livestock, when Richard Bagshaw rang up one morning. ” There are some sheep in the yards you might be interested in”, he said. 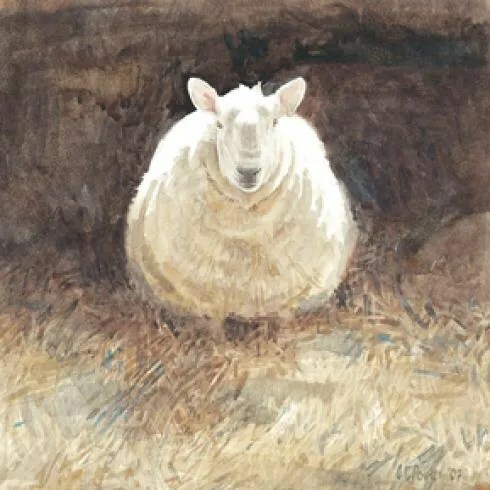 New enthusiasm engendered by what she saw that morning; the dust, backlighting, and a “bristol” board surface to paint on instead of traditional paper, resulted in a body of work that meant that for some time then, back at the beginning, Christine was known as a painter of sheep. 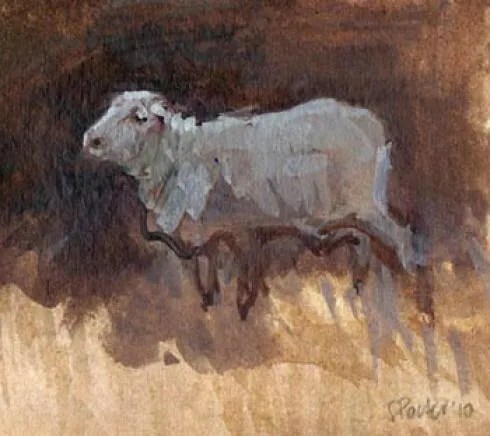 The first sheep paintings had dated from before she left teaching – 6 years before this phone call, when a holiday during shearing at “Abbotsford”, Hughenden gave her a first-hand look at what would develop into a career-long fascination. It was a few years later when the phone rang again – ” there are some cows and calves in the yards,” Richard said. 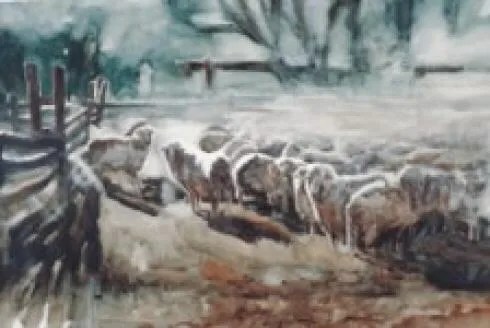 “Are you interested in having a look at them, seeing as how you liked the sheep so much…?’ Work from that series graces the shire council collection in Barcaldine and private collections Australia-wide. 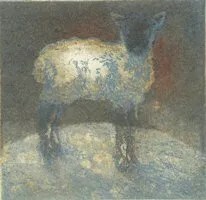 The cattle and sheep are a subject she returns to as the inspiration strikes, part of the story of the grazing properties she visits, as well as being subjects in their own right. …to be continued. Christine enjoys making artwork about the sheep and wool industry. Especially the sheep. Usually I’m there to paint the shed, sometimes there’s sheep in the paddock, or cattle in the yards. Sometimes they become part of the project . Sometimes they become a project all on their own. Sometimes it’s just about what they look like: the shape, the colour, the tone, the contrast, the composition. Sometimes it’s about the painting before it’s about the subject. That’s what being an artist is about. It’s not about making something because it might sell, or because it’ll look good with the sofa. It’s about what makes your heart feel like it’s coming into land at Barcaldine airport. In the middle of summer. In the oldest DC3 in the fleet. You’re not really sure if you are going to make it, and all you can think about when you land, moments after your lunch wants to, is that at the Royal Easter Show people pay good money for experiences like this. ‘Wyagu‘ Field sketch 2016 watercolour on paper 15x15cm Collection of the artist. 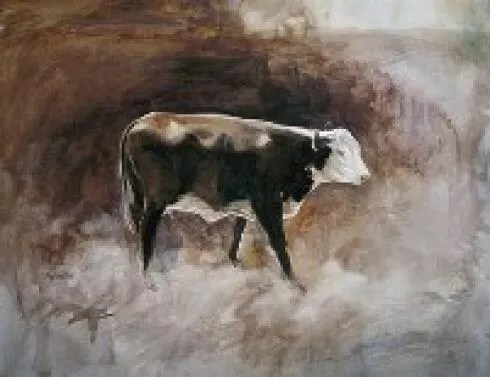 Just at the moment Christine has no cattle paintings available. 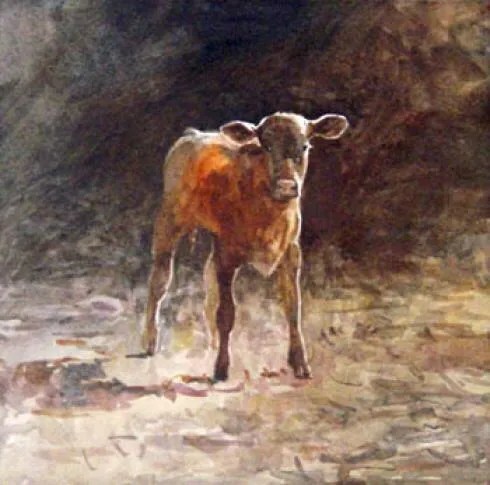 However if you are interested in commissioning her to paint your breed/herd/pet, she’ll be happy to consider it. 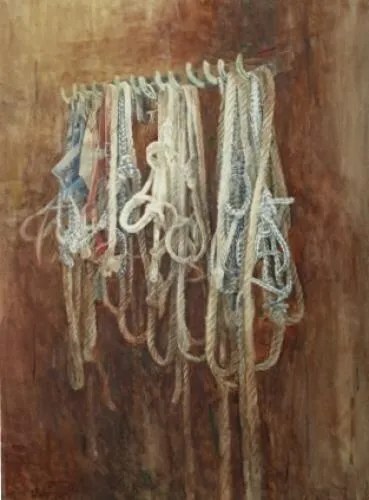 Follows are a series of paintings that have sold. ‘Tahlia’s song’ 2013. acrylic on powder-coated steel saw-blade. 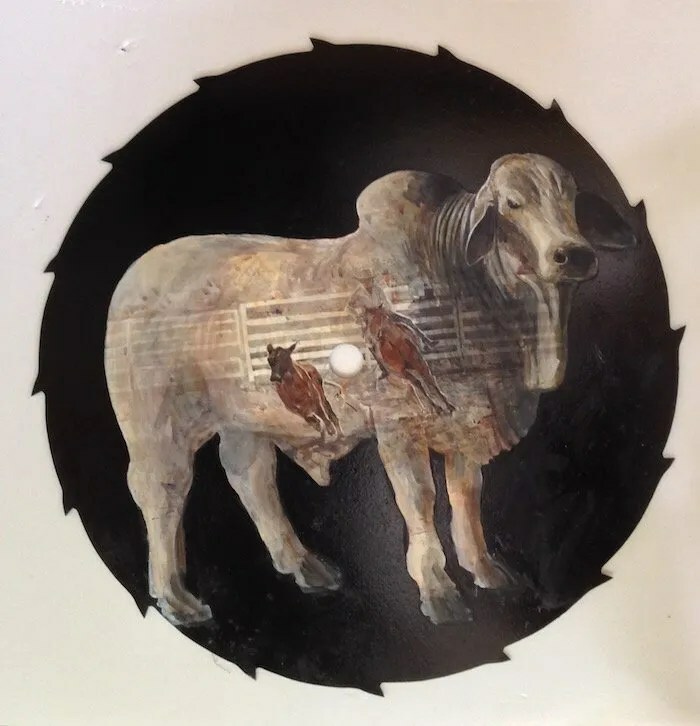 approx size: 45cm diameter Sold private collection The Story:It was a few months before Christmas when the young man from Rockhampton phoned to see if I could do a painting that he had an idea about for his fiance. She had cattle and was did horse-sports, and would I do a painting about them on a saw blade from his uncle’s sawmill, he’d asked. 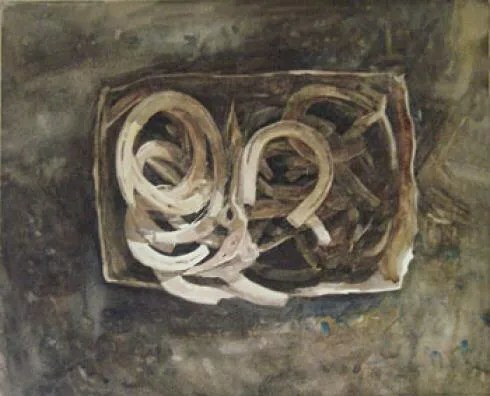 At first I was reticent: there are a lot of bad paintings on old sawblades. But I said I’d try. He sent the photos and the powder-coated saw-blade. After that it was just a case of designing. I enjoyed the process, though it not something I need as my main practice: I think I love paper too much to swap it for cold hard steel. But his fiance loved the work, I enjoyed doing it, and the young man was happy with the results. Win, win and win. If Australia rode on the sheep’s back, then it got there by climbing on the horse’s first. As I travel now, there’s little evidence of both the heavy horse that carved out the land, and the famous light horse that allowed for long range shepherding and that forged an Australian identity in wartime. On some places it’s not even a generation ago that the two-stroke replaced horse-power: in others it’s a distant memory. Unused blacksmith’s buildings, piles of stirrup irons, sheds full of old tack: museum sheds now, that were once a daily imperative. In nearly thirty years I’ve met only one family still using horses for everyday mustering, but I’m still meeting horse people and riders. 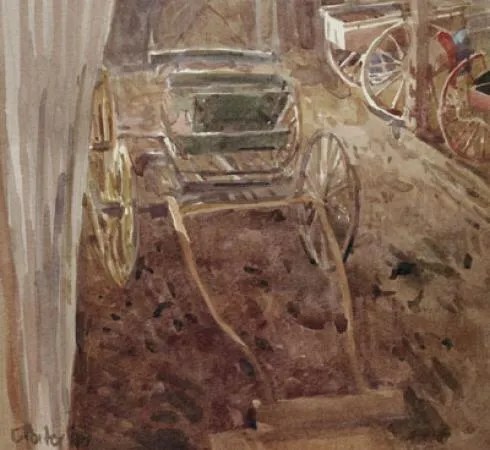 Sportspeople, professionals within the industry, hobbyists, breeders and more, all speak of a connection that goes far beyond the pedestrian need for workhorse or speed. The horse in Australia’s history constructed our landscape: the horse in Australia’s present celebrates it. 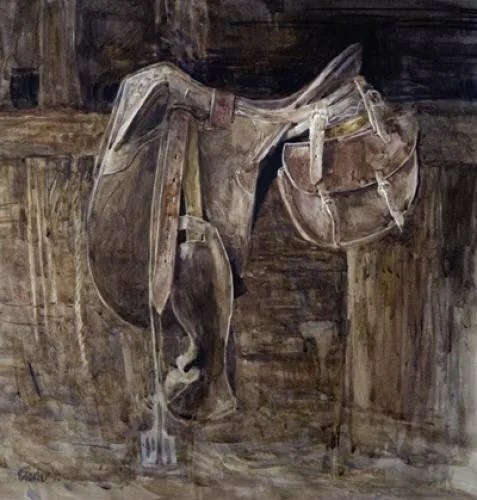 Christine has only a few paintings from the working-horse/horse-sports subject matter. Contact us for more information about price, availability, the possibility of other paintings not on this site, or to book a studio visit. Please be aware that the painting may look slightly different on your screen. 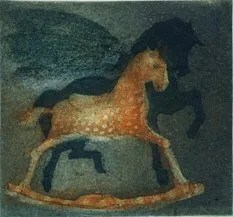 Even though I don’t usually make artwork about actual horses and their riders, I have skirted on the edge by using the IDEA of the horse in some of my etchings in the “other people’s treasures” series, using it as a symbol to explore more personal artwork. 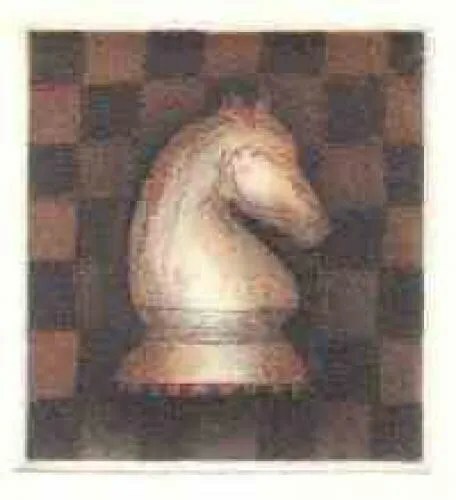 Full Moon Publications have published one of Christine’s horse and rider paintings as a greeting card. Full Moon Publications have published two paintings from this series as limited edition fine art Giclee prints.